"The play couldn't have come at a more necessary point in time, especially given therecent repeal of a protective gun law. It calls into question the future of gun-control and the consequences that could come. The GHOUL EXHIBITION is needed in these times of crisis... It is activism theatre at its finest." Since Homer, we’ve been telling stories about how we kill each other. Even before Homer: if theater was born through dance and storytelling around a paleolithic fire, it was to tell stories of the hunt, the fight, the clash, the kill. In the US, 90 people are shot every day. So far this year, 13,883 lives have been taken by firearms. America’s fascination with guns, the spectacular terror of mass shootings, the bloodletting in its inner cities, and the power over life and death that a gun confers make up the sinews of THE GHOUL EXHIBITION, a show that asks not just how, but why we kill each other. 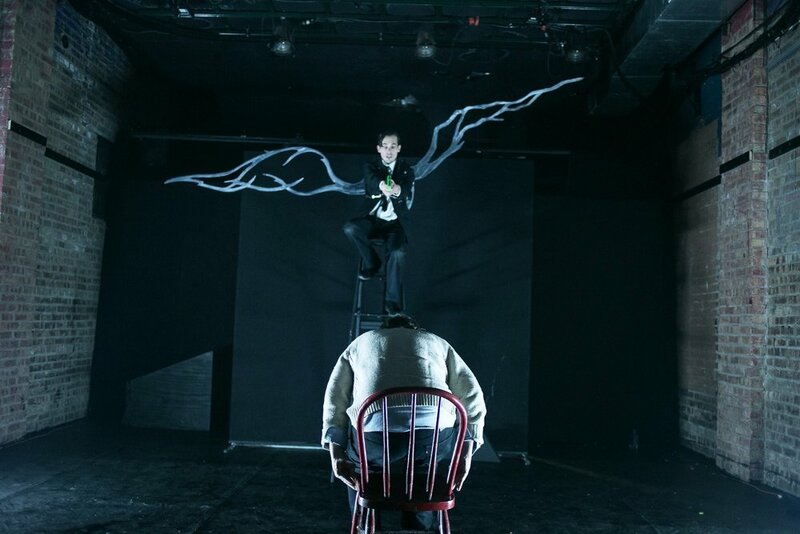 Created and performed by Héctor Álvarez, THE GHOUL EXHIBITION uses original and pre-existing texts, and a mix of physical theater, song, storytelling and audience participation to craft a dangerously intimate and unexpected dramatic experience that pushes the boundaries of the one-man show form. The result is a gripping and at times painfully funny catalogue of five stories. These include a teenage romance turned high school carnage, a modern day auto-da-fé for a white cop charged with the murder of a black teenager, and a screwball fable where mosquitos wield Beretta blue semiautomatics and orangutans scour the web for ammunition to fashion their deadly legacy. Amidst all this madness, the gun glows like a talisman, shedding light on larger themes of race, rage and retribution; but ultimately, THE GHOUL EXHIBITION seeks to create community with its audience, heal our hurts, foster forgiveness, and celebrate the resilience of our shared humanity. The Production was originally presented by The Tank, a New York City home for emerging artists. is a writer, actor and director from Spain based in Chicago. He has studied non-Western theater traditions in China, Japan and Indonesia, and in 2008 received a Watson Fellowship to research community-based performance in Latin America. He has a BA in Theater from Macalester College and an MA in Modern English Literature form University College London. As an actor, he has trained and studied with Augusto Boal, Peter Schumann, Malte Lambrecht, Guillermo Heras and Georges Bigot and has performed in more than 20 productions, most recently in Theatre Y’s production of Macbeth in the role of Malcolm. He has been an ensemble member of Theatre Y since 2015.
is co-founder and Artistic Director of Theatre Y and has focused her career on challenging material and international collaboration. She became a company member of Studio K in Budapest, Hungary upon graduating from Northern Illinois University in 2002 with a B.F.A. in acting. She has played the title role in several plays by Transylvanian writer András Visky including, Juliet (which received over two hundred performances worldwide) and I Killed My Mother (Chicago’s Best Actress Orgie award and featured on the cover of the New York Times Art Section). Her direction of Vincent River was described as “probing, harrowing, hallucinogenic truth” by the Chicago Reader. Lorraine directed the world premiere of The Binding, a collaboration between Theatre Y and two acclaimed Serbian/Hungarian choreographers. She recently directed Glen Berger's Underneath the Lintel and Nobel Prize winner Imre Kertesz's Fatelessness featuring dancer Benjamin Holliday Wardell. The 28th Annual Rhinoceros Theater Festival begins in January at the Prop Thtr. Each year, Curious Theatre Branch curates and produces the Rhinoceros Theater Festival, which provides production and exhibition opportunities to hundreds of artists, drawing thousands in attendance each year. The longest-running multi-arts fringe festival in Chicago, the Rhino features works in theater and performance from Chicago companies and national artists alike. First organized over 25 years ago in the Wicker Park neighborhood of Chicago, the Rhino is unique among national fringe festivals in that artists are never charged a fee to participate, and each year the programs are individually curated rather than selected on a lottery basis.